After 15 years in a building that, according to director François Hébel, "was always seen as temporary", the Fondation Henri Cartier-Bresson opened in a permanent home. T he move will see the institution, dedicated to the pre-eminent 20th-century French photographer, cross the river Seine, from Montparnasse in the south of Paris, to the Marais district in the city centre. The 800 sq m converted garage doubles the foundation's exhibition space, and Hébel wants to "make life easy for researchers" by grouping the collections, currently spread across Paris, in one place: "They will benefit from state-of-the-art preservation conditions that will allow them to start ambitious scholarship and lecture programmes." FRANCE. Paris. 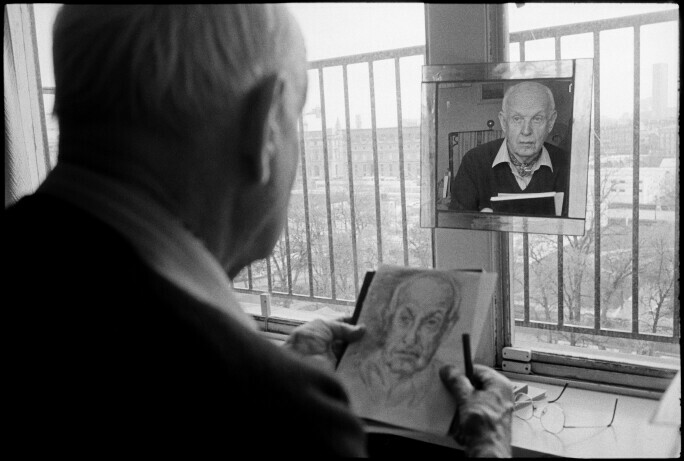 French photographer Henri CARTIER-BRESSON. 1992. © Martine Franck / Magnum Photos. The new site's Marais district location will situate Cartier-Bresson's already legendary work alongside similarly exalted artistic company. The nearby Musée Picasso is dedicated to the works of the great 20th Century Spanish artist, while the world-renowned Centre Pompidou frequently displays hugely popular and influential exhibitions of major modern and contemporary artists and movements. Cartier-Bresson’s radical photographic innovations fit neatly alongside Picasso’s revelatory 20th Century work and the modern art that Pompidou specializes in. The street-level entrance will enhance the site's accessibility, and its central location should attract many more visitors. As well as staging exhibitions on Cartier-Bresson – most famous for being a pioneer of street photography – the foundation will show work by his wife Martine Franck and a roster of contemporary photographers.